One of my favorite characters has got to be Janet– basically Siri or Alexa come to life. 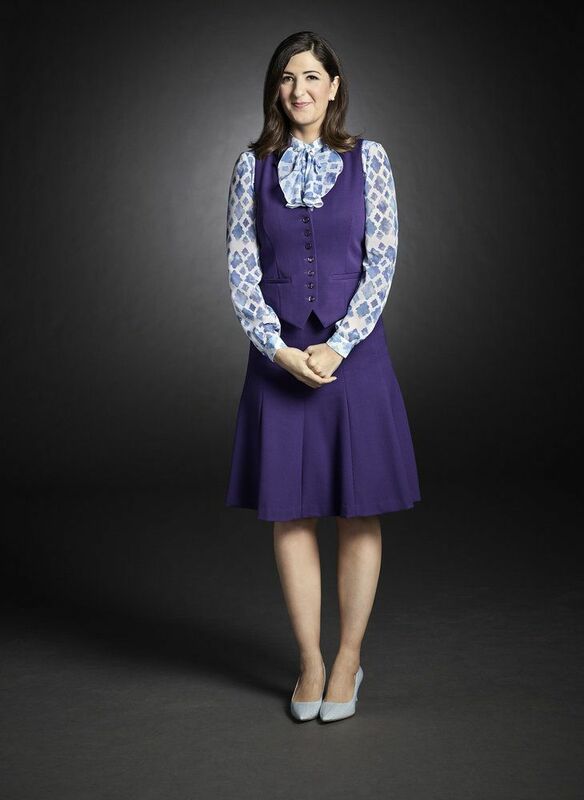 The actress, D’Arcy Carden, delivers her lines with a deadpan helpfulness that cracks me up every time, and her costumes are reminiscent of vintage flight attendant uniforms in a way that evokes the same feeling. So with Halloween fast approaching (and a newfound awareness that it’s always nice to have an easy, casual daytime outfit for more involved costume convention weekends), I decided to put together a Janet costume. I originally planned on finding a purple suit to start with, but it was harder than I’d anticipated to find one– mostly because all of the suits had pencil skirts instead of flared skirts. The closest I came was a wool suit with a pleated skirt, but the pleats bugged me and I’d still have to convert the jacket to a vest. I would have to start from scratch. Luckily I had a vest pattern in my stash that was basically perfect. It came with both collared and collarless options, and while Janet’s dark purple vest does have a small collar on it (only seen in some pictures because it’s hidden by the jabot), I decided in the end that it would be unnecessarily complicated and ultimately wouldn’t add anything to the outfit. Collarless it is! Since I wanted to make sure the vest had some structure while still being comfortable, I bought five yards of a double knit called “Pon Te Am Scuba Knit,” which bills itself as kind of a cross between regular ponte and scuba knit. It’s got some structure to it, doesn’t fray when cut, and has 15% widthwise stretch so it’s forgiving in terms of fit. Five yards is more than I needed, but I wanted to self-line the vest and also to ensure that I had enough fabric to replace any mistakes– I figured I’d rather spend a little extra to have enough matching fabric to re-cut pattern pieces if necessary. My pattern only went up to a size 12, which is a size smaller than the size chart said I needed, but I measured the pattern pieces and saw that it had plenty of ease so I was comfortable using it as a base. I cut a mockup to ensure that I liked the fit, and ended up tweaking the pattern a bit to get the shape of the vest as close as possible to the original– I raised the neckline, shrank the armholes, and lengthened the front hem by almost an inch. You can see my alterations here– the masking tape is all additions to the edges. I followed the pattern directions for stitching and turning the vest, though I had to keep careful track of things because my lining and outer fabrics were the same, and also had no “right” sides. I had a few issues, which is perhaps unsurprising given that it’s my first time using this kind of fabric. The stitching itself was fine– aided by my new walking foot– but the knit fabric didn’t press all that well, so the edges looked a little sloppy. I understitched as many of the edges as I could, but they’re still not as flat as I’d have liked. I considered topstitching all around, but ended up rejecting that idea because the original isn’t topstitched. I had the hardest time finding just the right buttons for this vest– they look very shiny and almost pearlized in some of the pictures, but for some reason I just couldn’t find any that matched. I ended up purchasing some buttons in light purple and painting them with nail polish to give them a deeper hue. I actually had to combine clear nail polish and dark purple nail polish to get a more translucent/pearly effect, but I think they came out nicely. I will note that once I got the buttons and pinned them to my vest I concluded that the 11/16″ size I’d purchased were actually too big– the correct size is probably 5/8″– but I wasn’t willing to go to the trouble of buying new buttons, so I just went with these. Next up were the buttonholes. I was leery about making buttonholes on knit fabric– I’d heard horror stories of stretching and waviness– so to minimize any issues I ended up (after several tests on scrap fabric) doing two things. First, I slipped a sheet of paper towel between the fashion fabric and the lining to act as a tear-away stabilizer (got the idea here), temporarily tacking it in place with some big hand-stitches. Next, I used buttonhole thread as the base for corded buttonholes, which keeps the buttonholes from stretching out during use. The one-step buttonhole feature on my new sewing machine made the buttonholes nice and consistent, which I’ve had trouble with before. Anyway, vest done! On to the skirt! Yes– while the actual fabric is out of stock at Mood (used to be available! ), you can get what appears to be a decent replica on Spoonflower to sew your own. Just search “Janet shirt.” Otherwise, you could try painting a regular blouse (didn’t work for me, you’ll see when I post about it) or finding a reasonable facsimile online– I know there’s a Merona blouse that used to be available at Target that had blue diamonds on a white background. Can I ask what pattern you used for the vest? This looks absolutely pitch perfect!!! It was an old Butterick pattern for ladies’ vests, but I did have to lengthen it and use more buttons than called for. Honestly, any fitted vest pattern would work, and I think the real costume vest has a notched collar that this vest doesn’t have, so you should be fine picking out any pattern.